I drove to Pittsburgh on Thursday and I made pretty good time. I left at 10:00 AM sharp and was parked at my hosts place nine hours and 57 minutes later. I stopped twice for gas which accounts for 37 minutes of that time (I got dinner at Panera the second time). I’m staying with a friend of a friend of a friend. My friend Dustin was roommates in Denver with a guy who is from Pittsburgh. I asked Dustin if he could ask his friend if he had anybody in Pittsburgh that would be willing to host me. I’ll be staying with one of the friends this trip and the other one in September. My host this weekend is Mark. He’s going to medical school and he is smart, suspiciously smart… (Victoria hates it when I use suspiciously where it shouldn’t be used). 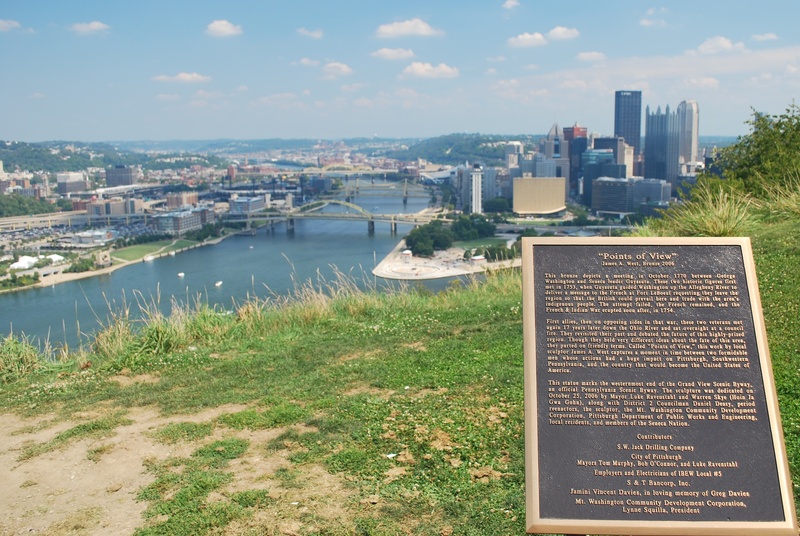 On Friday I went to a nearby bagel joint and then decided to visit Mount Washington and take in the accompanying views. I parked on Sweetbriar street and came upon this statue on the well named street that is Grandview. Nearby there is a plaque that explains what the statue is of (George Washington and Seneca leader Guyasuta). 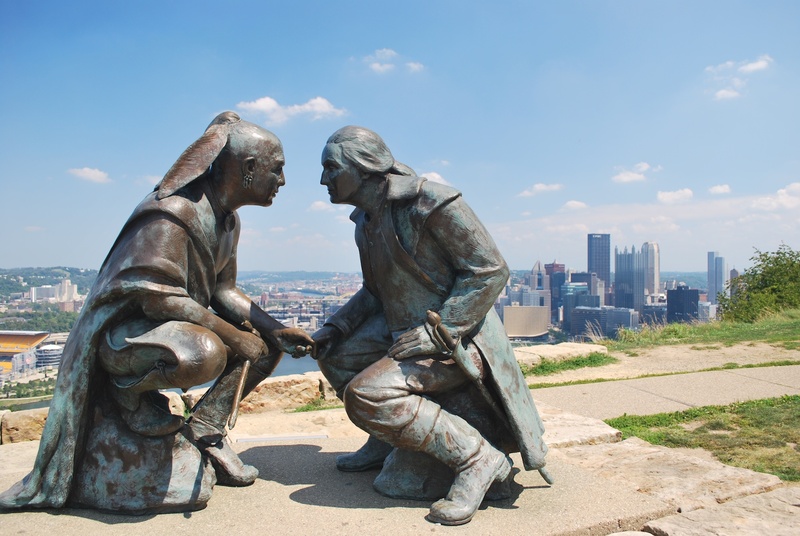 It’s a depiction of a 1770 meeting between the two. If you’re interested you can click the image below so you can zoom in and read the plaque. 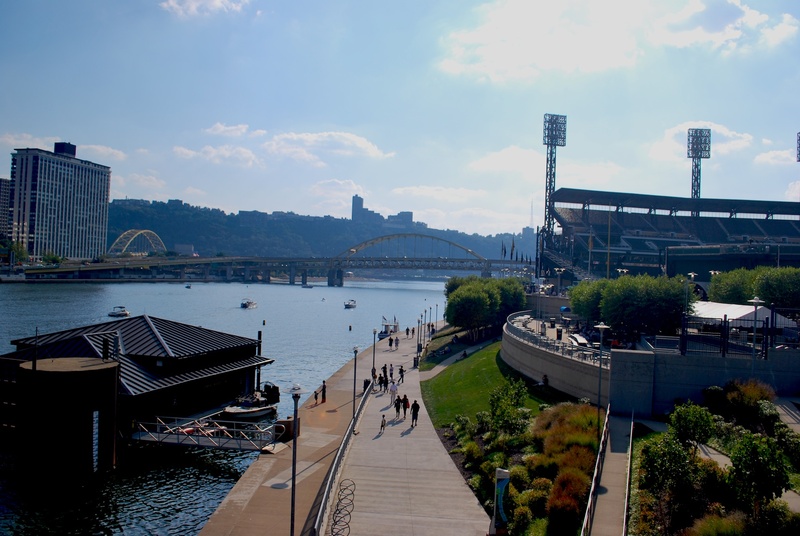 You can see PNC Park (where the Pirates play) off in the distance on the left side of the river. 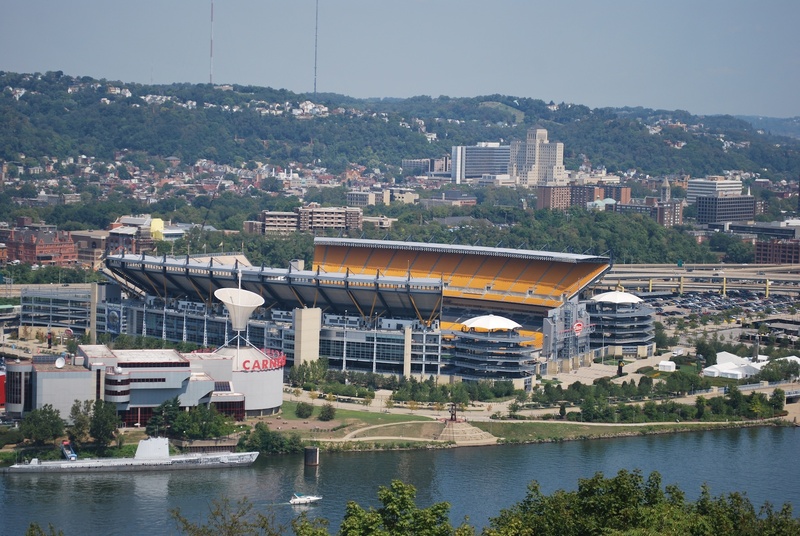 Heinz Field (where the Pittsburgh Steelers play) is also right across the river but it’s out of the frame in the pictures above. 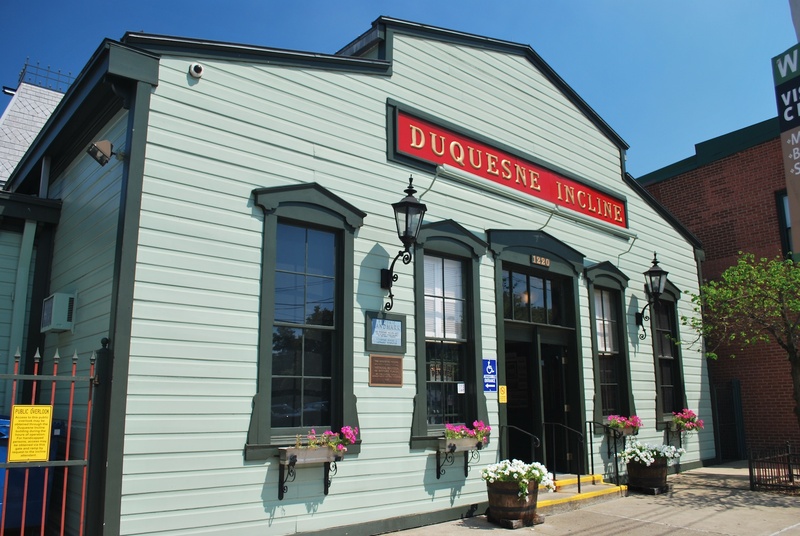 I walked southeast on Grandview for a bit and came to the Duquesne Incline. 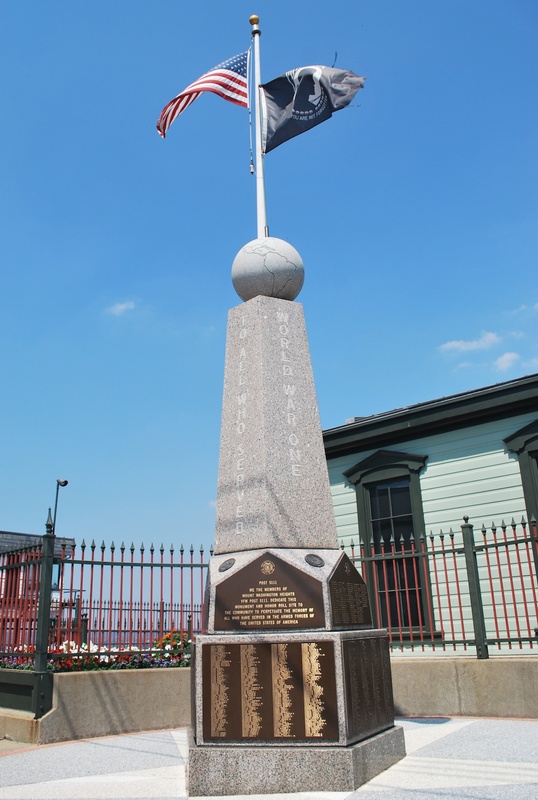 To the left of the building and closer to the sidewalk is a monument dedicated “To All Who Served”. 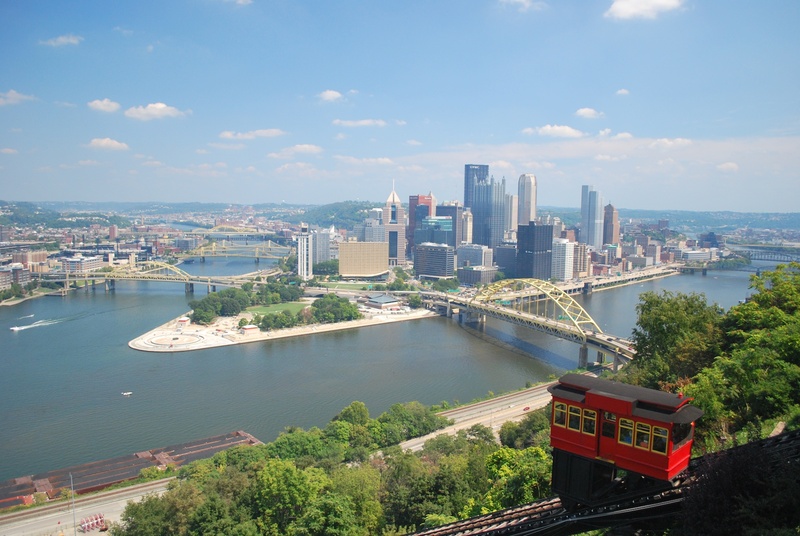 The River coming from the upper left is the Allegheny and the river coming from the right is the Monongahela. They come together in the lower left and at that point the body of water becomes the Ohio River. I took an artsy-fartsy shot and I’ve included it below. 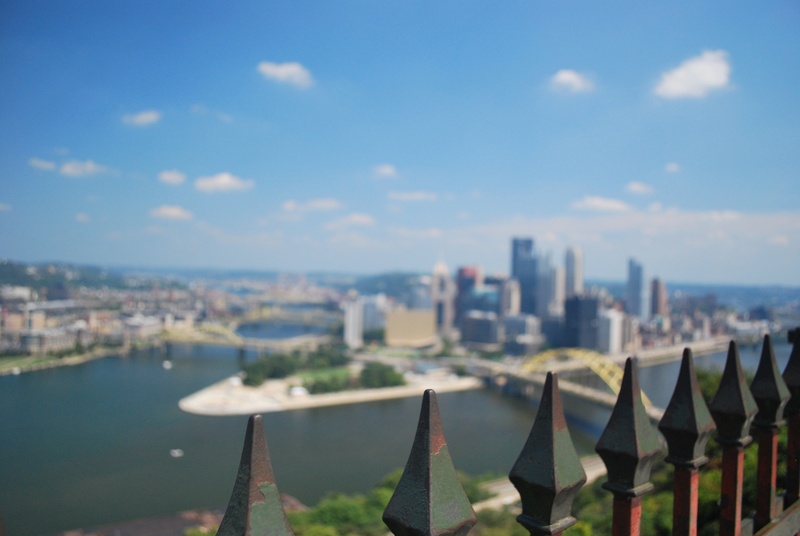 I opened the aperture to its widest setting and focused on the fence, providing a nice bokeh effect for the city in the background. 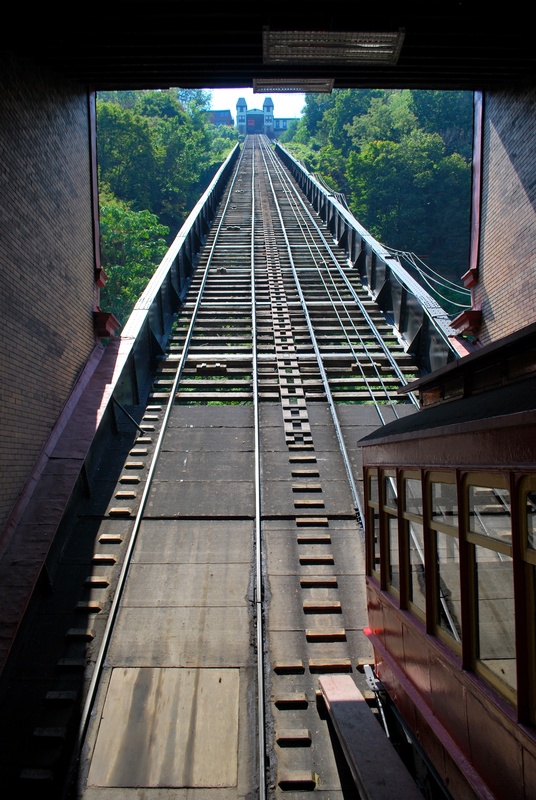 I decided that although it probably wasn’t worth the $5 roundtrip I would take the cable car to the bottom of the incline and back up. After I paid for my trip at the bottom I took a picture of the car with the incline it had just descended; pretty cool. 1) The exterior of the bar/restaurant on East Carson Street. 2) The bar with the beers on tap listed above it. 3) Five “Fat Heads Original” chicken wings. They were some of the best wings I’ve had, very spicy but not overwhelmingly spicy, for me anyways. The beer I had was Helltown’s Idle Hands Double IPA (8% ABV). After lunch I tried Fat Head’s own “Güdenhoppy”. 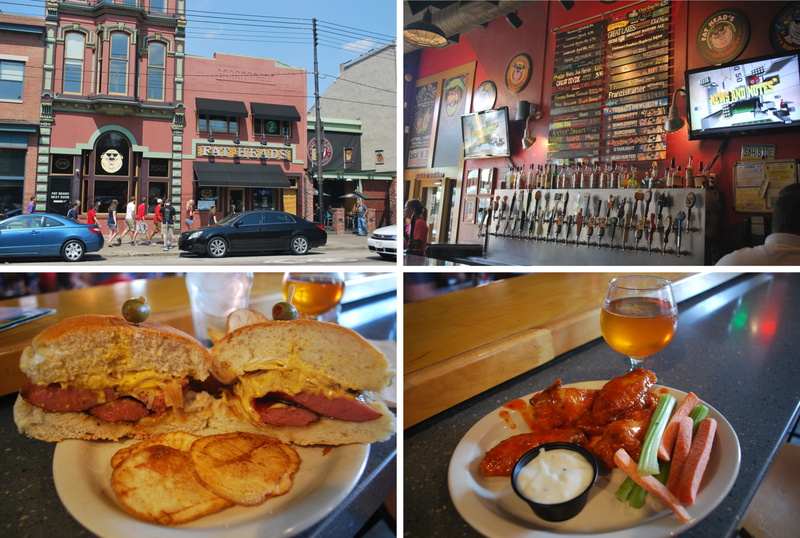 4) My lunch: The Southside Slopes, which consists of Kielbasa topped with fried pierogies, American cheese, grilled onions and horseradish sauce. There were more chips than just the three, but they’re hiding behind the monstrosity of the “Slopes”. If you want to check out the menu, click here, you won’t be disappointed. Kielbasa is just like a Polish sausage, so I’m actually going to count this in the sausage count. If you don’t agree with that…. too bad. I was stuffed after lunch and about 10 hours later I’m still stuffed. I rolled myself back to my car and left for the game at about 4:30. How long do you think it took me to drive 2.7 miles? How about 30 minutes… Yay! I was stuck on the Smithfield St Bridge for a bit so I took a picture of it. 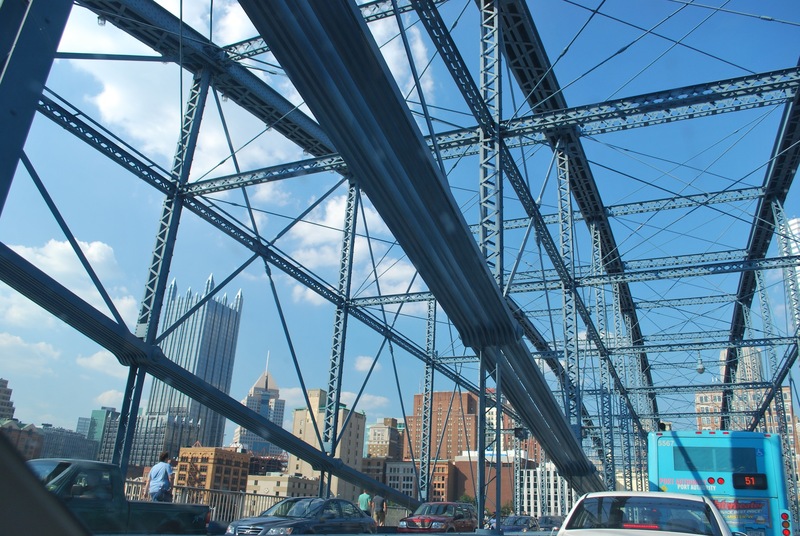 I parked in a $5 parking garage on Fort Duquesne Blvd and 6th street and walked across the Roberto Clemente Bridge to get to PNC Park. 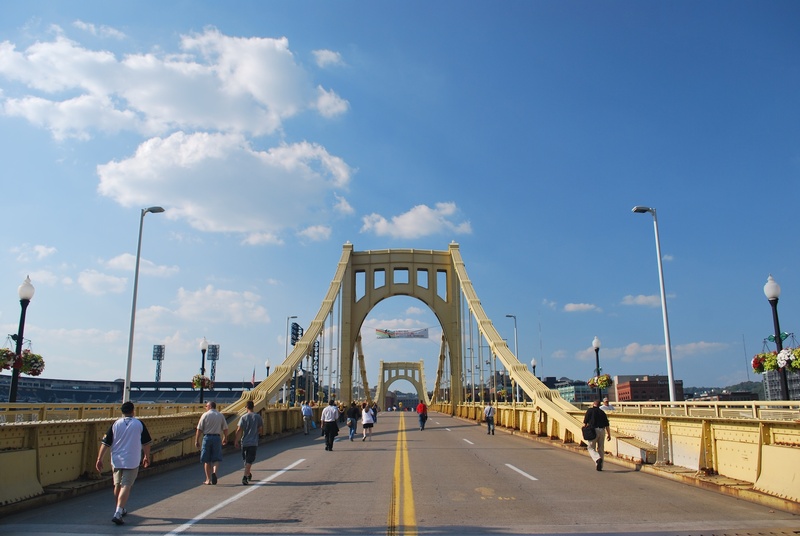 On game days they close the Roberto Clemente bridge to traffic. I’m not sure how long before the game but it’s at least 2 hours prior. You can see the top of the stadium and the light towers on the left. 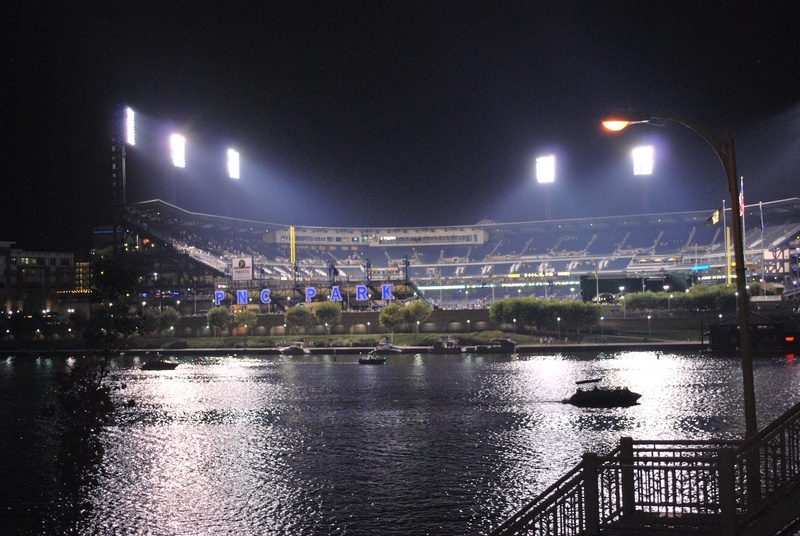 They have a nice river walk that goes along the river on the outside of the stadium. Occasionally a left handed hitter will *really* get a hold of one, hit it over the stands in right field, and the ball will bounce off the path and into the Allegheny. 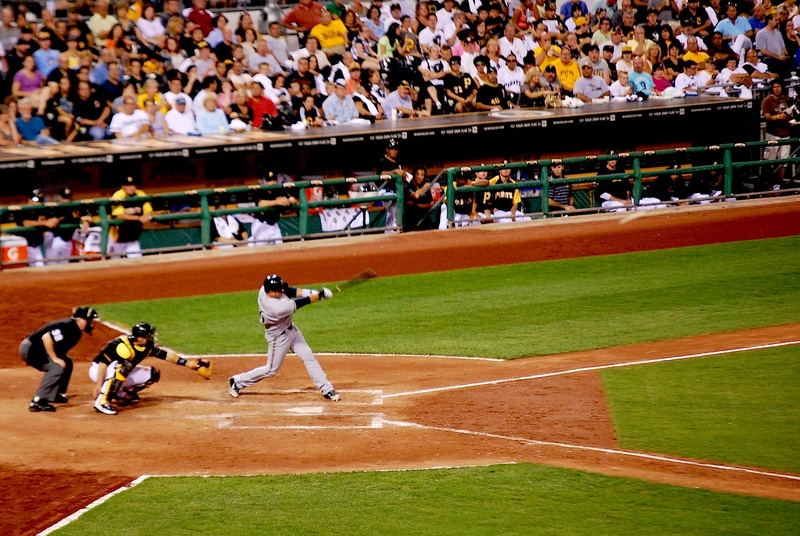 I was at a game in 2006 when Prince Fielder hit a 472-foot mammoth shot that did just that. 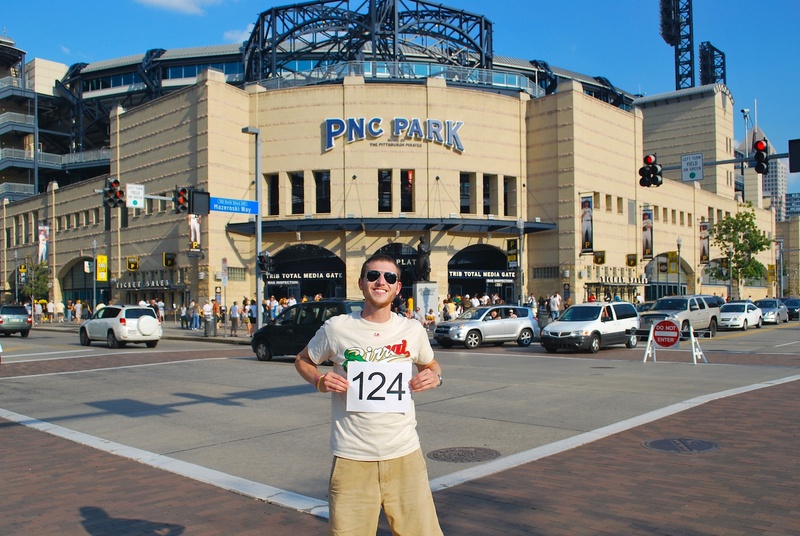 I walked around to the home plate entrance to get game photo number 124. 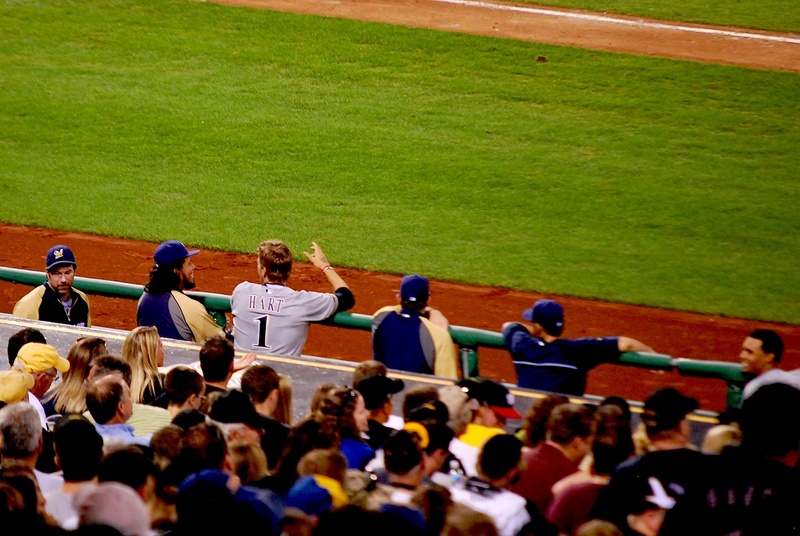 I had been to 8 Brewers-Pirates games at PNC in previous years, and I didn’t know what to make of all the people. I’m not complaining, it was just a different PNC experience. I had various people take a picture for me as they walked past. I kept asking because every shot wound up with someone inadvertently photo bombing it due to the busy intersection right behind me. I had plenty of time and I eventually got one that I was satisfied with. Thank you random fans! I picked up my ticket from will call and was inside by 5:55. I walked around to the camera guys in left center and talked to the Root Sports cameraman for a minute or two. I told him what I was doing and if he would talk to the producer about maybe having me on their broadcast for an interview. After talking with someone he said that they were aware of my story and would be doing something over the weekend. Score! Got to give a shout out to Ryan, a twitter follower, who tweeted at Root Sports Pittsburgh and told them what I was doing. I went and got my designated driver voucher and my drink and then went to my seat in section 108. A different twitter follower, Cooper, had tweeted at me the day before and said he wanted to meet up. He stopped by right before the national anthem and after talking for a bit gave me $20 to donate to Be The Match. Thanks Cooper! He’s a Brewers fan from Wisconsin who came out to see them play. I should’ve asked if he was named after Cecil Cooper. 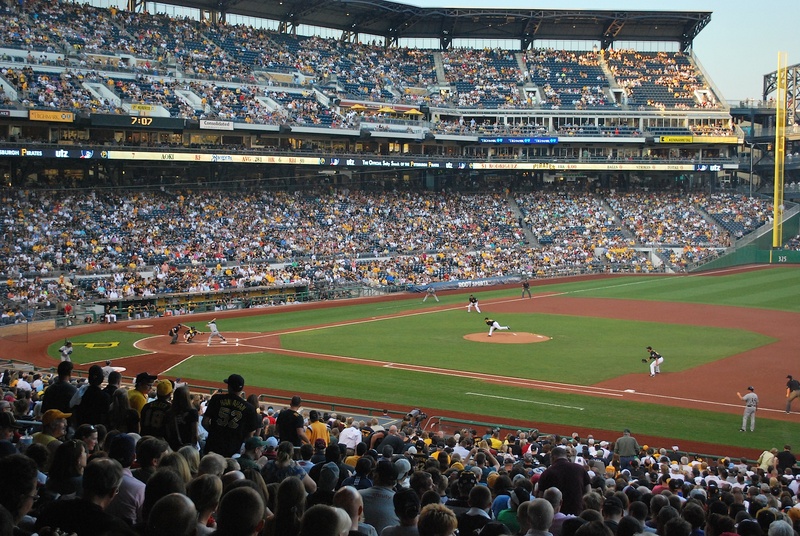 I’m not being mean, but it was weird being at PNC and having the stands full. It may look a little scattered above but it was the first pitch and it eventually filled up. It wound up being a sellout, nice work Pirates fans. The Brewers had an early 2-0 lead but it wouldn’t last long. In the bottom of the 4th the Pirates got the first two batters aboard and Andrew McCutchen drove them in with a single to left; tie game. 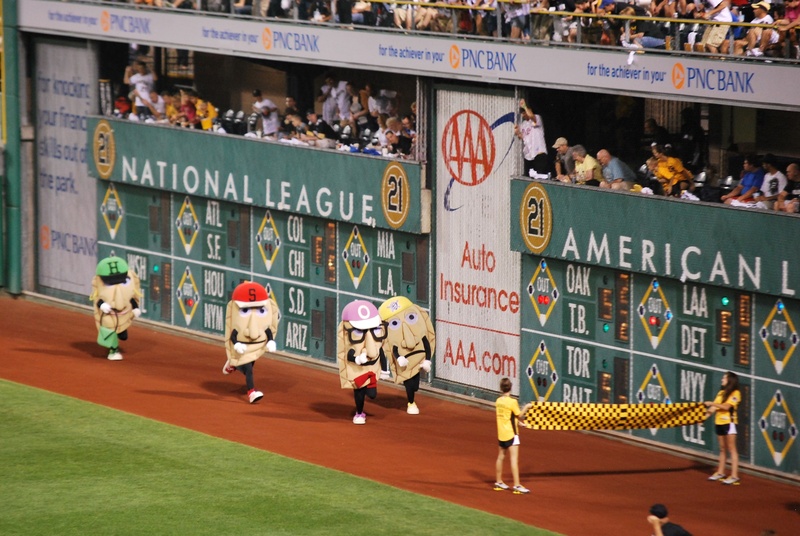 The Pirates have a Pierogi race after the 5th inning and it’s run on the outfield warning track as opposed to the infield warning track (like the sausage race). It’s not terrible (better than the animated races that some parks have) but it ain’t no sausage race. The sausage race started it all, is the gold standard for in-game mascot races, and is not fixed (I think). Aoki grounded into a fielder’s choice and then Rickie Weeks was hit by a pitch. Braun walked on four pitches and Aramis Ramirez stepped in with the bases loaded and two outs. The 0-1 offering was sent deep to right center and I thought McCutchen had a bead on it. 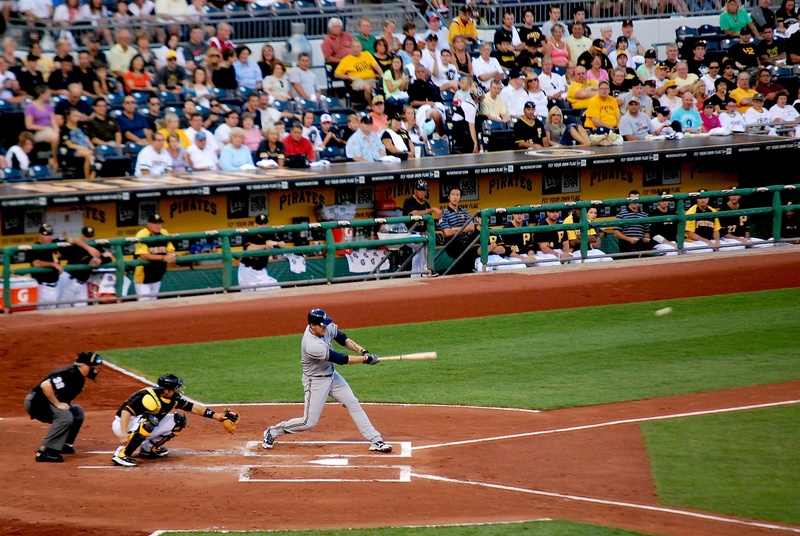 If you’re curious: the ball is just below the Pirates dugout fence, on the right side of the picture. 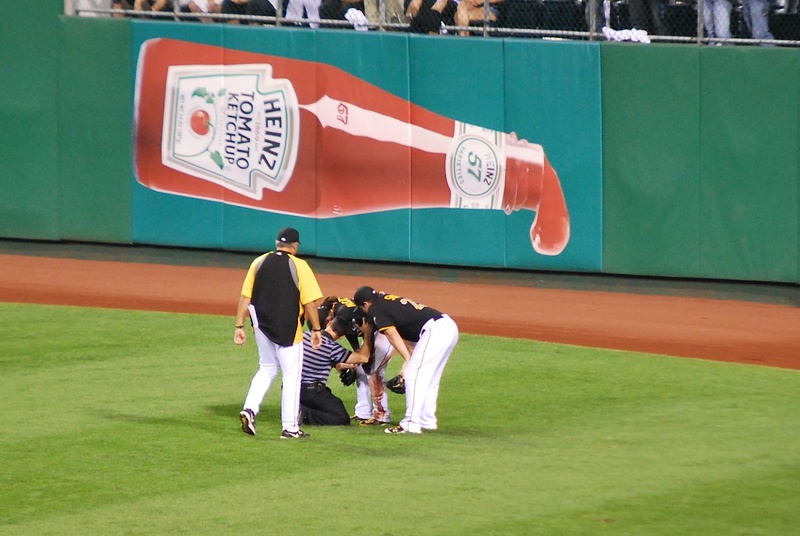 McCutchen slid into the wall and received some attention from the trainer. Clint Hurdle, the Pirates manager, eventually came out to see his MVP candidate. “Cutch”, as they call him, stayed in the game and it appears that he’ll be fine. 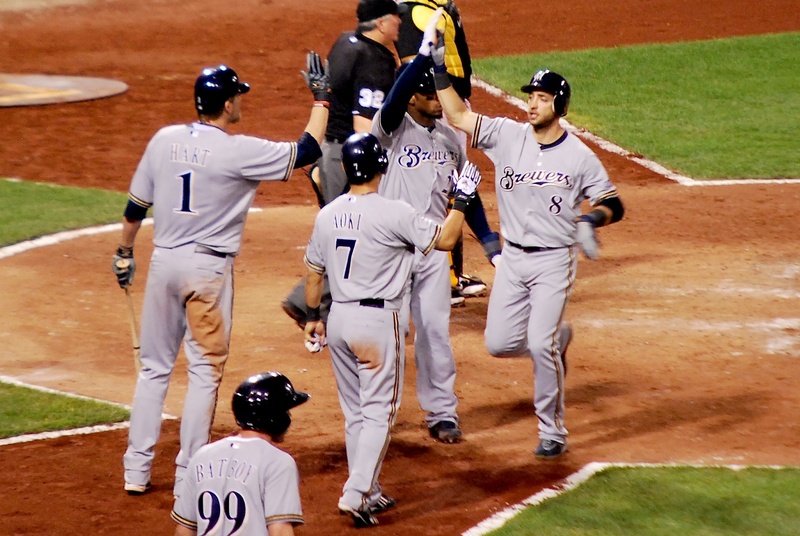 Corey Hart followed Ramirez with an RBI single and the Brewers had a 4-run lead. A solo home run by Rod Barajas cut the lead to 6-3 in the bottom of the 7th and it remained that way going to the bottom of the 9th. Axford came on for the save and walked the first two men he faced (not good). 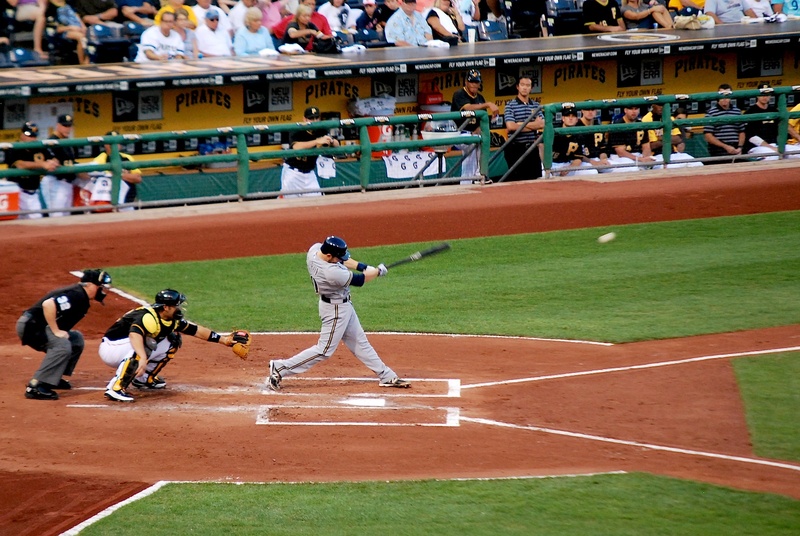 The third batter singled and the Pirates had the tying run at first base with nobody out. Axford then got two big strikeouts and it looked like he had found his rhythm. 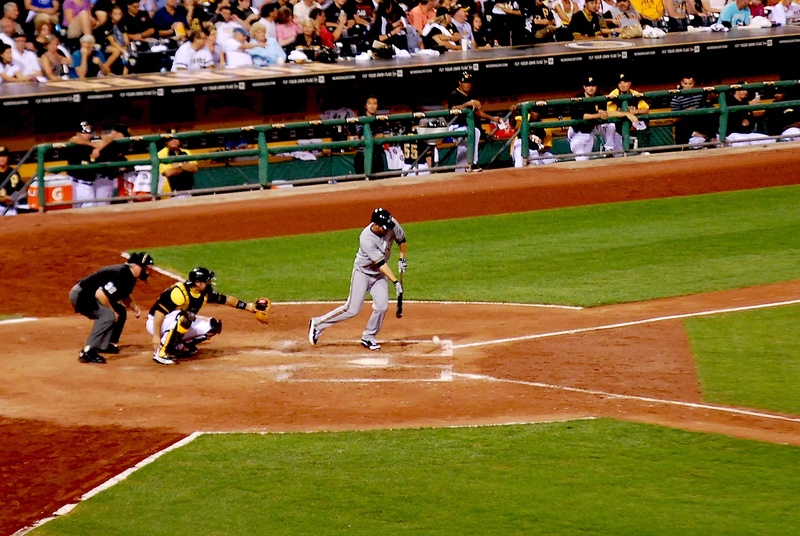 Michael McKenry battled for 7 pitches and on the 8th hit one up the middle to pull the Pirates within one. Roenicke opted to bring in Kameron Loe and it payed off. 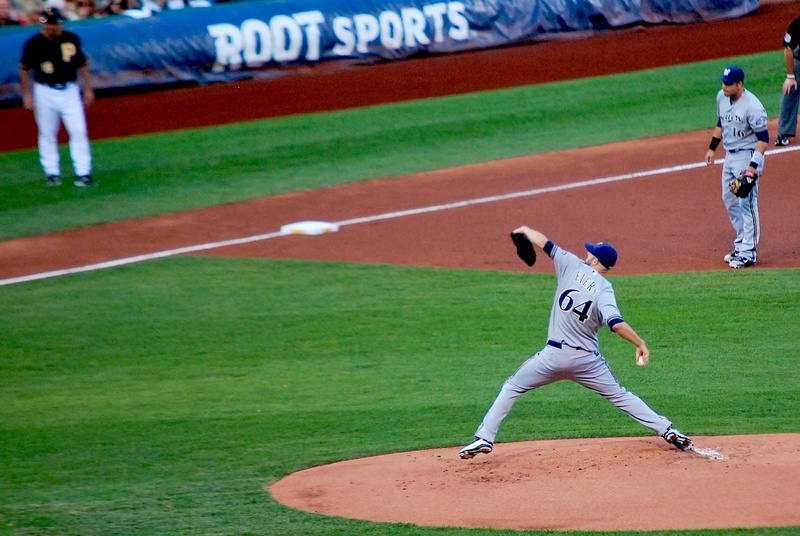 Loe struck out Gaby Sanchez and the Brewers hung on. Final Score: Brewers 6 – Pirates 5. 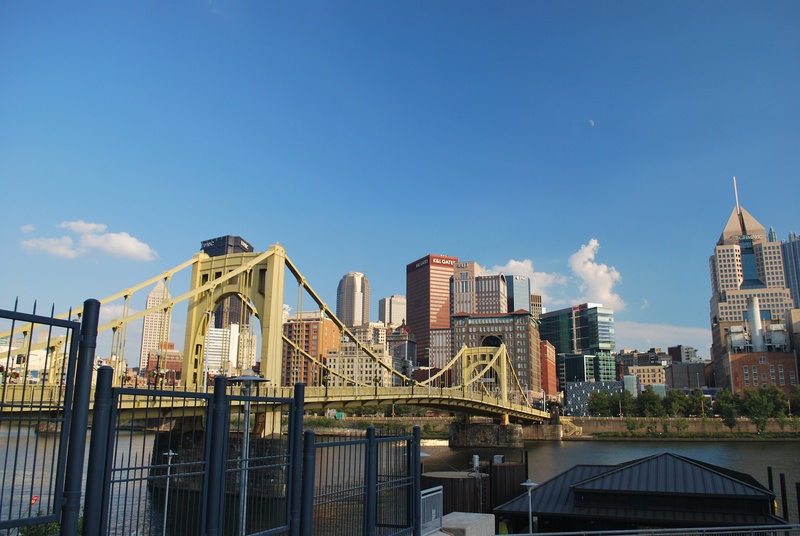 On the way back to my car I took a picture of PNC park, as seen from the other side of the Roberto Clemente Bridge. Game two is tonight at 7:05, game three tomorrow at 1:35 and then it’s on to Chicago.